New Orleans has lost 300 more officers than it hired since 2010 amid what some city leaders are calling a staffing crisis, officials said Wednesday. Even with new recruitment efforts finally underway and the promise of hiring 100 new officers over the next year, the City Council is looking for new ways to put more police on the streets faster. The New Orleans Police Department is budgeted for 1,260 sworn officers this year, but currently has around 1,200 on hand, said Superintendent Ronal Serpas in a hearing before the City Council’s criminal-justice committee on Wednesday afternoon. That city has lost 306 more officers through retirement, resignations and firings than it hired since Serpas took office in 2010, and he acknowledged that 1,260 is too few for New Orleans — a better number, he said, would be 1,575. “Please don’t think that I think we are better with fewer cops,” Serpas told the council. 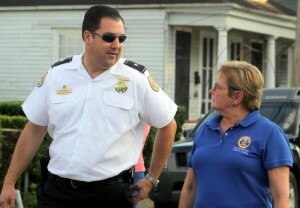 Not counting the headquarters staff and centralized investigation divisions (such as homicide, traffic and others), that leaves roughly 70 or 80 officers in each of the city’s eight districts — except the French Quarter-based Eighth, Serpas said. Each of the districts has its own investigative staffs, and after time off and sick days, about six or seven officers are assigned to take calls in each district during each of the day’s three shifts, Serpas said. Even that figure was challenged, however, by attorney Eric Hessler of the Police Association of New Orleans, who said that after desk duty and special assignments, there are more like three officers actually answering radio calls each shift in each district. Regardless of the exact number on the street at any moment, what was undisputed is that police response times have grown significantly. With staffing where at its current levels, Serpas said, it may be “hours” before an officer reaches an important but non-emergency call such as an automobile crash without injuries. The Office of the Inspector General released a report this week that includes data showing the average response time grew 31 percent from less than nine minutes in 2010 to more than 11-and-a-half minutes in 2012. The real change, Serpas said, is that the city stopped recruiting officers amid massive holes in the budget. Hiring slowed dramatically in 2010, stopped altogether in 2011 and barely restarted in 2012 and 2013, his data showed. Now, the Police and Justice Foundation is aiding in an online marketing campaign to help recruit more qualified officers, targeting people who are searching for law-enforcement jobs. Since mid-July, nearly 1,000 NOPD job applications have been downloaded from their new website, joinnopd.org, said foundation chair Sandra Shilstone. Meanwhile, episodes of “The First 48” will begin airing in January, showing the work of NOPD homicide detectives on the street, and departments where the nationally-televised reality show airs typically see boosts in recruiting, Serpas said. One obstacle to those efforts, she said, is that there is currently no way to turn in those applications online. When a representative of the city’s Civil Service Commission said they had been working on that project for some time, the City Council suggested that a hard deadline of two weeks be set for the city’s technology department to get that worked out. Once potential recruits apply, testing and background checks typically take about six months before they can be hired and taken to the academy. Only about 10 percent of applicants are hired, Serpas noted. Training then takes several more months, after which they will be assigned to the streets with a training officer. “It took longer than any of us would have liked to get the program up and running,” Serpas said. Challenges to the recruiting process abound, however. One major obstacle, the police union representatives said, is the recently-reinstated requirement that officers live in the city. Not only is the cost of living higher, but some qualified officers in surrounding jurisdictions might simply not want to uproot their families to come work in the city. If the City Council doesn’t believe that, said attorney Raymond Burkhart of the Fraternal Order of Police, they should try suspending the rule for a year and then witness the ensuing jump in recruitment. Serpas said he was not there to question the council’s decision on that policy, and that residency requirements are debated in cities across the country. “I just don’t want to be at a disadvantage,” Serpas said. Other challenges loom. City Councilwoman LaToya Cantrell said she hears regularly that officers are leaving the department because they are unhappy with its direction. “Our own survey, from the people that call us and we hear on the street, believe that morale is extremely low, and that is contributing to the lack of recruitment efforts,” Cantrell said. Serpas strongly disagreed. Scientific surveys of the department show that satisfaction levels within the department are comparable to other organizations, and that the NOPD also has a regular share of employees who are perennially angry — and they are often the loudest, he said. Officers are working with less than they ever had before, but complaints are down and training hours are up, Serpas said. Most of the officers aren’t calling to complain because they are busy doing their jobs. The next major challenge to all these efforts will be the consent decree. With limits on detail work that supplements officers’ pay and a general cloud over the department from working under a federal judge’s orders, morale will be even lower, the perception of the department will plunge further, and more officers will leave and be even harder to replace, the police unions said. Countering that, however, will be the addition of the new recruit classes, Serpas said. When officers who have ridden out these lean years with the department start seeing the roll-call rooms fill up again, their confidence in the job will improve, he said. Promotions and raises have also been reinstated for the first time since he arrived, he said. “Our officers worked hard, now we’re going to be able to start hiring and we’re very excited about it,” Serpas said. Amid the long-term cycle of recruiting, the City Council sought immediate ways to bolster the department’s ranks. One suggestion they offered was to replace all the sworn officers in civilian jobs with civilians, and send the officers back onto the streets. In theory, Serpas said, that might help. He listed 22 positions in the department, such as media spokesmen and technology workers, currently filled with sworn officers that could be done with civilians. But he would then need a $1.2 million increase in his budget for the new civilian positions, or he would have to decrease his recruiting to fill the jobs. Further, even if the new jobs weren’t replaced, 22 veteran officers back on the street might be more effective than hiring 22 rookies, Head said. Pulling officers out of those jobs against their will, however, might worsen morale, however, Serpas cautioned, and those officers might simply take their specialized skills elsewhere. Another suggestion by Head was to take sworn officers out of the front desks of the individual police districts and replace them with civilian receptionists — freeing up an officer for each shift, a total of 24. Serpas said that the front desks are traditionally manned with officers because the stations are open 24 hours a day, and they provide a level of security, as well as handling people who come directly to the station to report crimes. “I’m not sure we have thought that through enough,” Serpas said after the meeting. After the meeting, Serpas said that he believes that the NOPD will return to its budgeted 1,260 officers next year, and that even the 1,575 the department needs may one day be attainable. The City Council members said they wanted to continue exploring the transfers to get officers on the street, however, even if it requires that additional $1.2 million. They are going to continue discussing the residency requirement as well. But even after three hours of discussion, they said, many of the issues surrounding the department still need more attention. If the numbers above are accurate, only 40%-50% of our officers are on the street. The idea of moving some officers from jobs that can be handled by civilians is a very good one, and a redefinition of rank may also be in order. But the budget question concerns me. If we are losing all these officers, where is the money going? Labor is the most expensive part of any police force. We’re not only paying salaries, but benefits, too, and officers vested enough to retire are making a nice wage. Replacing them with recruits at the bottom of the totem pole is going to save a lot of money. Since the budget has not been reduced, we should have ample money to cover the cost of civilian replacements, especially since they would likely not be eligible for the same benefits package. Before we hand the department more money, we really ought to look at the payroll vs. budget numbers very closely. I doubt that many of the offiers that are leaving are retiring. The economic drain on the budget is the recruitment process and the cost of training for officers that don’t stay long. We have a desire to make the force look like the community and we hire marginal recruits not likely to last long on a professional police force. Cognitively deficient, obese cadets with sketchy criminal backgrounds or psychological problems don’t make good cops. The marginal performers also drive out good cops that have to work with and rely on them. $30.5 million dollars worth of drain? We’re budgeted for 1583 officers. If that’s true, Jexni, the NOPD’s recruiting problem just got even worse…Costco just signed up all the talented Free Agents. NOPD’s going to have to look elsewhere. Serpas is asking for a police force that would normally serve a population twice our size. It’s insane. But our population isn’t normal..
Aside from the murder rate, which is constitutes an incredibly small proportion of violent crime, our crime rates are typical for a major, dense urban area. I don’t think our population isn’t “normal” in a way that requires a greatly oversized police force. Disagree. A shooting-death-a-day average is not normal for a city of under 400,000, and not a trifle. It is at the core of the issue. Notably, when the force was greatly increased under Pennington, I believe, the violent crime rate responded directly, or am I misremembering? Wait a second. Didn’t the Superintendent of the NOPD say that “criminals are generalists”? Yet the NOLA murder rate is 10 times the national average. Hence, the criminals in New Orleans are really specialists in one type of crime, murder. I’m just curious, but with 2-3 hour police response times (which I know from personal experience), a significant portion of the population which distrusts the police and thus unlikely to call them, and allegations by experts that the crime statistics appear to be under-reported in the city when comparing the murder rates across the country, don’t you think there’s a chance our non-murder crime rates are higher than the NOPD tells us? What are you talking about? St. Louis’ police department houses 1,800 employees. When we have just two or three cops patrolling a district at a time I’d say its imperative that we get more cops. Why do you think response times are so slow? Thank you Robert Morris for finally covering this story, and doing so in a professional fashion. This story has been shamefully neglected by the more established local news media – Times Picayune I mean you – for at least a year and a half. can or will openly talk of, but many are working to fix. 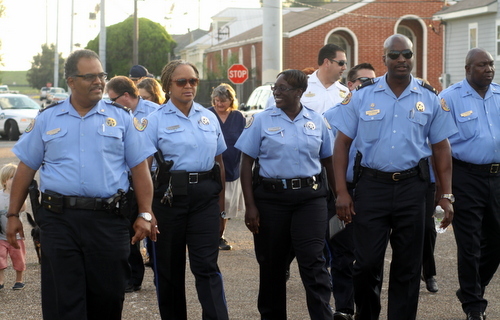 Like it or not- NOPD needs us and we need them- lets help. Hours need not be in quotations. Have been sitting Uptown waiting for the police to show up to a vehicle accident without casualties for 2 hours and 45 minutes, as I’m writing this it’s creeping up on 3 hours. We’ve called multiple times to check on the status of an officer. They couldn’t tell us when to expect someone. I am taking family around the city for the weekend, and in 3 hours we could have been spending money at shops and restaurants instead everyone in my party is sitting on the sidewalk regretting their trip. Happens all the time and it’s getting worse.